Deputy Rick Grimes is desperately looking for his family. National authorities recommend finding refuge in Atlanta where a quarantined safe-zone is established. When Rick arrives in the city, riding a horse, he realises that the safe-zone is no longer safe and the city is completely infected by zombies. However, everything is not death and devastation: we can notice a peaceful/harmless pigeon walking (not dead) on the street. Its search for some herbivorous food was suddenly interrupted by Rick and his horse and it decided to fly away to a more quiet area. Pigeon activity: The pigeon was walking around a city that was totally infected by zombies. This is a clear example of how pigeons can survive in hostile environments. Then, the bird was suddenly scared by a guy on a horse and flies away. From the pigeon's point of view: a horseback rider never provides any food so it is better to elude him. Symbolism: It represents typical pigeons that we can find in any city. Once more, pigeons appear in the most intense moment of the episode. In this case, it is used for showing us that this devastated city still keeps some remains of its old life. Relevance: Very low. 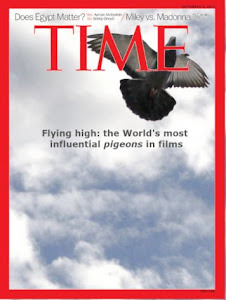 The pigeon has some protagonism in the scene (it is actually situated in front of the main character) but the whole scene lasts just few seconds. 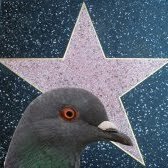 Additionally, the pigeon relevance for the rest of the episode is negligible. Training level: High. This pigeon isn't actually a casual wild animal but it was left there by a professional team. It is a well trained pigeon. Pigeon Quest: spot the movie!! Stardust memories: rats with wings! !